Cuban mojo marinated pork a traditional dish, in Cuba, is very popular. Traditional ingredients include sour orange juice, fresh garlic, and salt with a variety of herbs. This amazing recipe instead swamps out sour orange juice for fresh orange juice, orange zest and fresh lime juice, that creates the amazing flavour you are about to enjoy! The citrus is such a great pairing with the pork! A perfect summer combo! You can use fresh mojo criollo as a marinade for pork, chicken, beef, fish or turkey or as a condiment to serve with your favourite meat dish. The Cuban mojo marinated pork is so easy to make, yet will impress your guests or family. Mash the garlic, salt and peppercorns, using a mortar and pestle or use food processor. Stir in the sour orange juice and let it sit for at least 30 minutes. If making the recipe without the oil you can stop at this point. It makes a perfect marinade for seasoning, chicken, fish, pork &/or beef. If preparing the mojo with the oil continue after you have stirred in the juice, onion & oregano. Allow marinade to sit for at least 30 minutes or longer. In a saucepan heat Spanish olive oil to medium hot & then remove from heat. Whisk oil in garlic-juice mixture, until well blended. You may store for at least a week in the refrigerator. 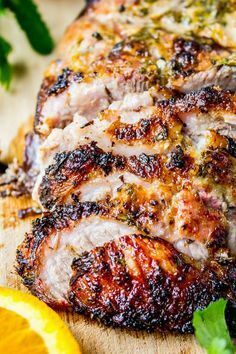 0 Response to "Cuban Mojo Marinated Pork Packed With Flavour Easy To Make"